On 23 June 1961, the headline on the front page of Audio-Visual Selling (AVS), one of the trade publications of the advertising industry, announced that, “This was Britain’s year at Cannes”. For the first time a television commercial, entered by a London advertising agency, produced by a British production company with a British director, had won the Grand Prix for television commercials at the International Advertising Festival in Cannes. Perhaps more remarkable was that, in an international competition, a slapstick parody of British gardening programmes, and starring the television comedian, Benny Hill, had won over the judges. Video 1. Min Kim Hyeon, Cannes Lions Winners (1954-2012). Please visit the online version of the article to watch this-video. Hundreds of British commercials had been entered for the competition since 1955; for the last three years Britain had entered more television commercials than any other country. In the previous year there had been 584 films in competition from 25 countries, approximately half were television films and British production companies were responsible for 166 of these (and just 74 cinema commercials).3 However, much to the chagrin of the advertising industry, British television commercials had always lost to American, French or Italian entries: so this was, for the advertising industry, a major coup. It was also a significant achievement for a production industry that had little experience of television, or making short advertising films, prior to the launch of commercial television. Cinema advertising was a minor advertising medium, and cinema advertising films were not constrained by the precise timings of television spot advertising. This paper will explore how the advertising agencies, that wrote the advertisements, and commissioned the films, and the film production industry, which made them, re-configured themselves to adapt to this new advertising medium. More specifically, although American advertising is often seen as the precursor for early British commercials, this paper will use two case studies, that of Joop Geesink’s Dollywood, and Screenspace with André Sarrut, to illustrate how, in the first few years, advertising agencies drew on the expertise of production houses and directors from mainland Europe. Little academic attention has been focussed on the period of early commercial television advertising in Britain, and few writers have addressed the emergence of television advertising production. The advent of ITV in Britain is most frequently written of as the launch of a new televison channel, not a new advertising medium.6 Those writers who have taken advertising as their topic have tended to take a theoretical approach7, which has led, as Liz McFall8 has argued, to advertising remaining an over-theorised area, lacking in empirical research. Alternatively, the writer’s focus has been on advertisements as texts, rather than their production.9 Even writers, like Nixon, Schwarzkopf and West10, who have examined the advertising industry in the 50s and 60s, have concentrated on individual advertising agency case studies, rather than aspects of the production industry. The limitations of the current body of work on advertising films has been discussed in the recent (2016) publication from the British Film Institute (BFI), Films that Sell; moving pictures and advertising, the BFI’s first collection of papers on advertising.11 While this is a welcome addition to a very small library, it attempts a breadth of coverage that includes commercial films for all forms of release: theatrical, television and other sites, and has case studies from many countries; the result is that early British television advertising is still hardly addressed. This paper, therefore, draws on a wide range of primary sources including the trade press, interviews with practitioners active in the 1950s, material held by the History of Advertising Trust (HAT), the on-line archives at the British Film Institute (BFI), International Movie Database (IMDB) and Dutch Vintage Animation, and fan sites. All these sources have inherent problems for the researcher. Writers for the trade press had specific agendas, often promoting their own organisations. Practitioners are recalling events of over 60 years ago; memories are fallible and individuals tend to over-state their role in events. The film archives hold little television advertising, mainly retaining feature films and sponsored cinema films.12 Fan sites are often the only source for the TV commercials but these are rarely dated accurately, and do not include data on the production company, advertising agency or director. Therefore, a process of triangulation has been used to link the films, with data on the people and organisations involved in the production; for example, films from fan-sites have been cross-checked against stills published in the trade press. 3 Did Television Advertising Rescue the British Film Production Industry? Some within the production industry were optimistic that ITV would address this decline. Howard Thomas, a director of Associated British Pathé wrote, “If only half of the commercials were filmed [rather than broadcast ‘live’ or produced abroad] this would represent two hours of film a week – more than half the entire output of the British Film Producers Association”.16 It is difficult to understand how Thomas made this calculation; the only variable that was known, in April 1955, was that six minutes of advertising would be permitted for every hour of broadcasting. Nevertheless, television advertising became an important income stream, and it would be a valuable addition, to the research on the British film industry, to understand its financial and creative contribution. In 1955, the smallest, and least prestigious, sector of film production in Britain was cinema advertising. This was the only sector of film production that advertising agencies had been involved in. Clients and manufacturers commissioned the production of their sponsored films directly with the production company; it was only for cinema advertising that advertising agencies created the ideas for their clients, and also commissioned the production company to shoot the films. However, this form of advertising only accounted for a tiny, and declining, share of advertising spend in Britain, just 1-2%.18 The result of the size and status of cinema advertising was that most clients, and their agencies, would only have experience of working in static paper-based media. Even with newsprint rationing, press advertising accounted for nearly 90% of all advertising spend in Britain, in the 1950s. Cinema and radio were low-status media for advertising agencies. Brian Palmer, who wrote the first television commercial to be broadcast in Britain, was a very junior copywriter at Young and Rubicam in 1954, and explained that, as the latest recruit, he was not given press advertising to write, that was retained by the senior writers, leaving him with radio and cinema work.19 The result of the low status of cinema advertising was that even the largest London agencies rarely produced an advertisement for the cinema, and no agency had experience of producing films for television. This lack of experience, and confidence, within the advertising industry meant that not all advertising agencies, or their clients, were satisfied with the production expertise on offer from British production companies. The largest British agencies, and American multinationals including JWT, Young and Rubicam, McCann Erickson, and Lambe and Robinson, had offices on mainland Europe, as well as London, and admired the technical sophistication of cinema advertising in France and Italy. Given this traffic across the Channel, it is not surprising that London agencies were open to considering the use of Continental production companies, and, in the drive to retain business, British production companies were active in establishing partnerships with foreign directors. The use of Continental production companies brought prestige, experience and a veneer of sophistication to the advertising agency and client. Even before commercial television had launched in Britain, Lynne Reid-Banks wrote that, “many agencies and clients are clamouring for that touch of je ne sais quoi”.24 Reid-Banks went on to describe the cinema commercials, from French director André Sarrut, and the Franco-Russians Ladislav Starevitch and Alexander Alexieff, as “little masterpieces”, albeit expensive, and requiring more shooting time, than their British counterparts. Two companies that were particularly successful in gaining commissions for British commercials were Screenspace, who offered the service of French director, André Sarrut, and the Dutch animation company, Dollywood. Joop-Geesink’s Dollywood was set-up in 1947, and made promotional films using the full range of film techniques: live-action, animation and puppetry. Their first clients were Dutch, but, by 1953, Dollywood had established a relationship with the British brewing company, Guinness, to make cinema films for Britain, and had made animated commercials for American television, such as those for Beechnut chewing gum. Video 2. Beech Nut - Variety Show, 1955. Please visit the online version of the article to watch this video. Dollywood were internationally renowned for their technical expertise in animation and puppetry. Their founder, Joop Geesink, travelled widely in Europe and America drumming up new business. The model of cinema and sponsored film production, where the client worked directly with the production company, meant that Dollywood had built relationships with the clients, rather than the advertising agencies.26 However, in London, advertising agencies were responsible for creating advertising for television, and the (re)negotiation of this relationship can be illustrated by comparing Dollywood’s 1953 cinema commercial for Guinness with its first television commercial, broadcast on the launch night of commercial television in London, on 22 September 1955. 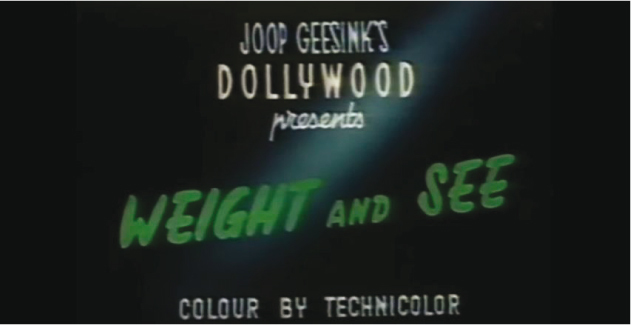 The 1953 cinema commercial for Guinness announces itself, in the opening frame, as a “Joop Geesink’s Dollywood Production”, titled “Weight and See”, mimicking the style of feature film credits. It is a sophisticated piece of film-making in full colour, using a mix of puppetry and animation. The story is simple; two men are moving girders with a crane, which begins to falter under the weight of the girder. Seeing this, one workman drinks his Guinness, his muscles bulge, and he easily hefts the girder onto his shoulder and walks off with it. The strapline used is “There’s nothing like a Guinness for strength”. Video 3. Ultimate Guinness UK Television Adverts Collection Ads Idents Commercials. Please visit the online version of the article to watch this video. The idea of this film is drawn from one of Guinness’ most memorable posters, designed by John Gilroy in 1934, for the advertising agency S.H. Benson. S.H Benson had coined the strapline, “Guinness is good for you”, and had held the account since the 1920s. 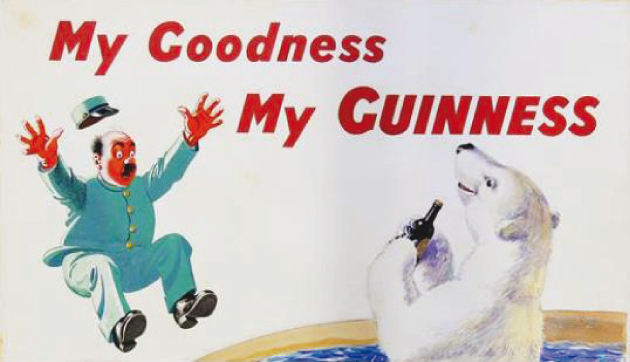 However, S.H.Benson’s Guinness poster campaign had evolved in the 1950’s, and now featured a range of Guinness-stealing zoo animals and their hapless Guinness-drinking keepers, and it was this campaign that S.H.Benson wanted the advertising community, and their clients, to see on the first night of commercial television. Compared to the cinema advertisement, the television commercial is far less sophisticated in terms of its animation and technical quality. The black and white commercial is predominately live action; the zoo-keeper’s Guinness is stolen by a sea-lion who balances the glass on his snout as the zoo-keeper runs frantically to retrieve it. The zoo-keeper was played by Charlie Naughton, the well-known Scottish comedian and one of the Crazy Gang. 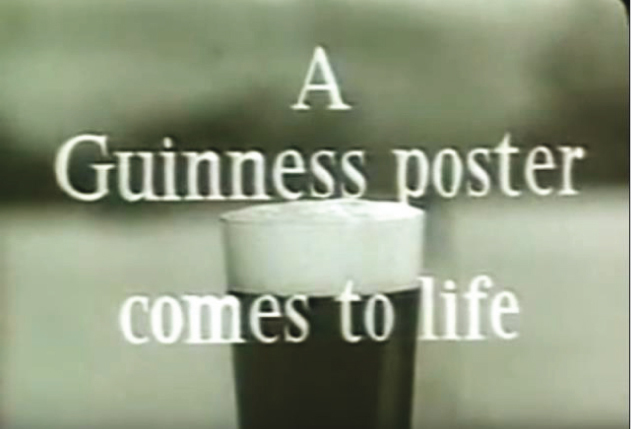 The strapline used is S.H.Benson’s creation, “Guinness is good for you”. Video 4. Guinness - Sea Lion, 1955. Please visit the online version of the article to watch this video. With the advent of commercial television the advertising films for Guinness had been moved firmly under the creative control of S.H.Benson, who had diplomatically retained the production company that had the confidence of the Guinness client. Dollywood were a truly international film animation company, however, by the early 60s the fashion for animated commercials in Britain declined, and, although the company continued to make sponsored films for Dutch companies, they became financially overstretched. Joop Geesink filed for bankruptcy in 1971. French directors and production companies started to make commercials for British television in the first months of ITV. The Franco-Russian director, Alexander Alexieff, established a partnership with AdVision and Gaston Charpentier with Impact Films. Unlike the companies of Joop Geesink, there is little published information on the advertising produced by these French directors; however, one of the most prolific appears to have been André Sarrut who was represented in London by Dimitri de Grunwald at Screenspace. Information on these Continental directors, and their contribution to British advertising, has been gleaned from contemporary trade press, and, inevitably, what is available is dependent on how successful the directors were in self-promotion. However, even with this proviso, there is valuable material to be gained from a detailed reading of the trade press. In addition, IMDB and the BFI hold data on the feature films and documentaries of Sarrut, Starevitch, Charpentier and Alexeiff, however, there is little mention of their British television commercials, and few survive. Sarrut had started his career designing advertising posters and was well-established as a director of cinema commercials in Paris by the 1950s. When commercial television launched in Britain, Sarrut and Dimitri de Grunwald, actively promoted their technical expertise and French cinematic sophistication, aiming to differentiate their approach from British directors. 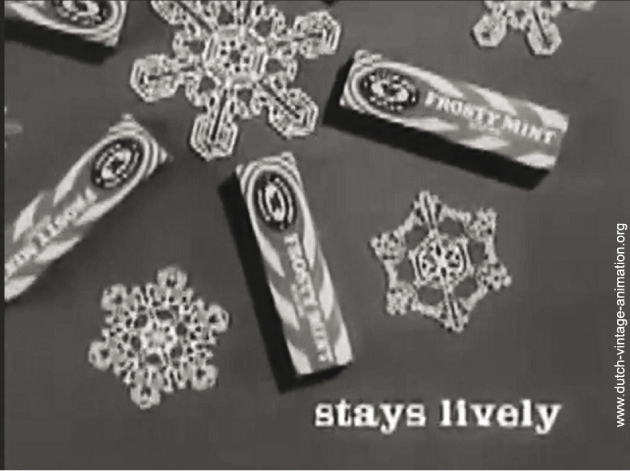 In 1958, Lambe and Robinson commissioned Sarrut to direct five sixty second television commercials for Camay toilet soap on behalf of their client, Procter and Gamble. The press coverage of the production continually reiterates the relationship of the campaign with “the world of feature films”, pointing out the expense of the production, the cost of the sets and the use of a famous Parisian restaurant and the Grand Hotel as locations.33 In overblown prose, Sarrut is described as “a man who tackles a commercial in much the same way as D.W.Griffith must have approached Intolerance.” Although the television audience would not be aware that the production company was French, the commercial illustrates the belief that being French, or Parisian, was the acme of sophistication to British consumers. 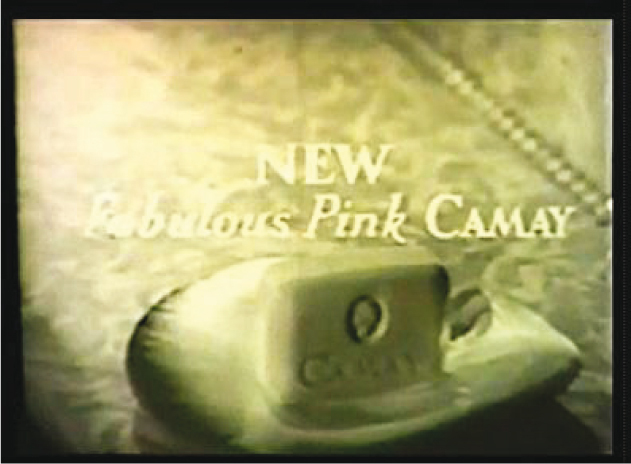 The voice over, in the commercial, reiterates that the soap contains “Specially imported French perfume, costing over 5 guineas an ounce”. The BFI do list some commercials in this campaign but the only example available is Grand Hotel, on a fan-site. Video 5. Camay – Grand Hotel, 1958. Please visit the online version of the article to watch this video. These Sarrut commercials for Camay won a prize at the International Advertising Festival in 1958, providing a platform to demonstrate the competence of a London agency in creating and commissioning television advertising. Sarrut continued to direct British commercials, but the fashion for French production companies and directors declined in the late 50s. This decline seems to have been the result of a number of factors. Firstly, these directors appear to have commanded a premium price and required lengthy studio time. As Britain’s production industry responded to commercial television advertising, studio facilities became more easily available and there was an increasing choice of experienced, and possibly cheaper, home-grown directors. Secondly, Continental directors and production companies had worked directly with clients on mainland Europe, which gave them much greater creative control. This model was more attractive to directors like Sarrut, but anathema to British advertising agencies who were intent on retaining control of the creative ‘idea’, thus more amenable British directors may have been preferred.35 Thirdly, the Common Market (European Union) was in development offering a much larger pool of prospective clients using commercial television and cinema in Germany, Italy and France. Responding to this, Screenspace opened a German office in 1958.36 Both Screenspace and Dollywood were, therefore, less dependent on the British market. However, Continental production companies and directors would not have been replaced by their British counterparts if advertising agencies had not been confident that these could deliver the same creative and technical expertise. That these skills became available in London was the result of the evolution of a particularly British model of advertising film production. 10 British Ads by British Companies for British Tastes? At the launch of ITV, the American style of TV advertising was seen as demonstrating a model of loud selling and haranguing salesmanship; aspects of commercialism that the British Parliament had been eager to avoid in the 1954 Television Act.37 Although, by 1955, many countries had launched commercial television including Cuba, Brazil and Italy, Britain was unique in the world, in that only spot advertising was permitted.38 Sponsorship was forbidden, and the channel received no public funding. With feature film production declining, there was significant financial pressure for British production companies to persuade the larger advertising agencies, which were responsible for the majority of television commercials, to give their television advertising commissions to them. If British production houses could deliver the quality of the French directors and Dutch animators, then television advertising production would be in British hands. Dozens of British production houses started up, some were very short-lived, but others had a long and profitable existence. Two examples, Anglo-Scottish Pictures and Television Advertising Ltd. illustrate different routes into television advertising production and rather different working practises. TVA believed that offering the skills of experienced directors of feature films and television programmes would appeal to advertising agencies. To this end, they used Karel Reisz, who had worked in the Ford Motor Company’s in-house production department, before he made feature films, and Michael Law, Joe Mendoza, Richard Lester and Terry Bishop, who had already made sponsored cinema films and television programmes, to make commercials for their clients. Their house advertising in the trade papers, as the example below illustrates, continually reiterated the skills of all their staff. Unlike most film production companies, whose studios were outside London, TVA’s three studios were in Wardour Street, close to the Soho offices of the largest advertising agencies. TVA lacked the established client relationships of Dollywood or Anglo-Scottish Pictures and focussed their business efforts on the advertising industry. This included screenings of their commercials to London and regional advertising agencies. Figure 10. A Family Tradition, 1954, produced for Shippam Ltd by Anglo-Scottish Pictures. Video 6. 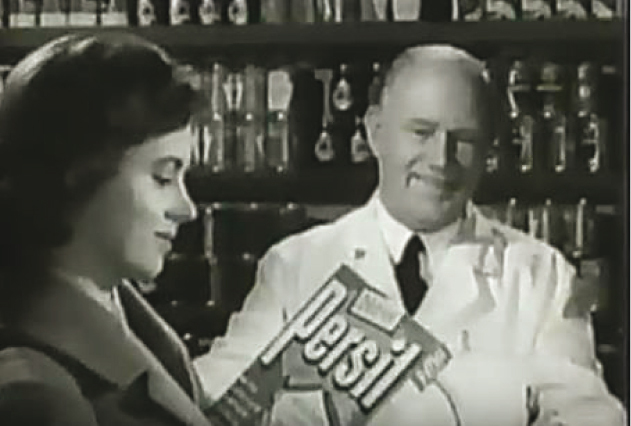 1950s - Persil [Confidence]. Please visit the online version of the article to watch this video. TVA also took advantage of the fashion for animated commercials, setting up a subsidiary company, Television Cartoons (TVC). They recruited the Canadian, George Dunning, to run TVC, after United Production of America’s London office folded, and Dunning found himself unemployed. TVC also employed Richard Williams and Jimmy Murakami. All three had established reputations as animators and, by 1961, TVC were producing dozens of cartoons each year. 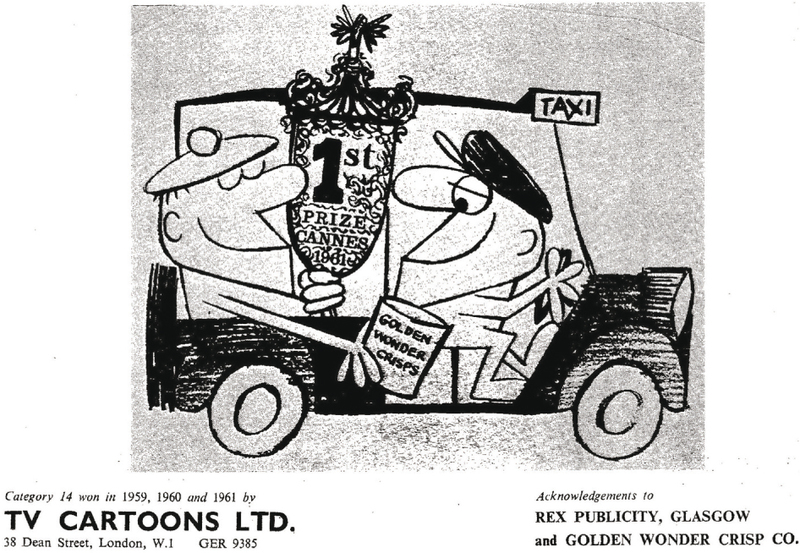 TVC won first prize in the television cartoon category, at the 1961 Advertising Festival, for their commercial for Golden Wonder Crisps. TV Cartoons promoted this success by advertising in Audio-Visual Selling. TVA and TVC’s specialisation in television advertising delivered a very successful business, producing hundreds of films each year. In August 1960,Televison Mail listed over 300 commercials produced by TVA and 50 by TVC, compared to 185 from Anglo-Scottish Pictures who made both television commercials and sponsored films. The founders of Anglo-Scottish Pictures had been in the same RAF Film Unit during WWII and, by 1955, they were a well-established company, producing sponsored documentaries for theatrical release for clients like the Ministry of Health, Cadbury’s Chocolate and the Foreign Office. The BFI holds over 100 of their sponsored cinema films from 1947 to 1977.47 Anglo-Scottish built its own studio, Halliford, near Shepperton.48 This location reflected the model of feature film production, where companies sited their studios outside central London. Anglo-Scottish cultivated directors who were experienced in sponsored cinema films, like Leonard Reeve, and the new specialists in television advertising, including David Paltenghi, rather than directors of the more prestigious feature films and television programmes. Their house advertisement promoted the skills of these directors (below). 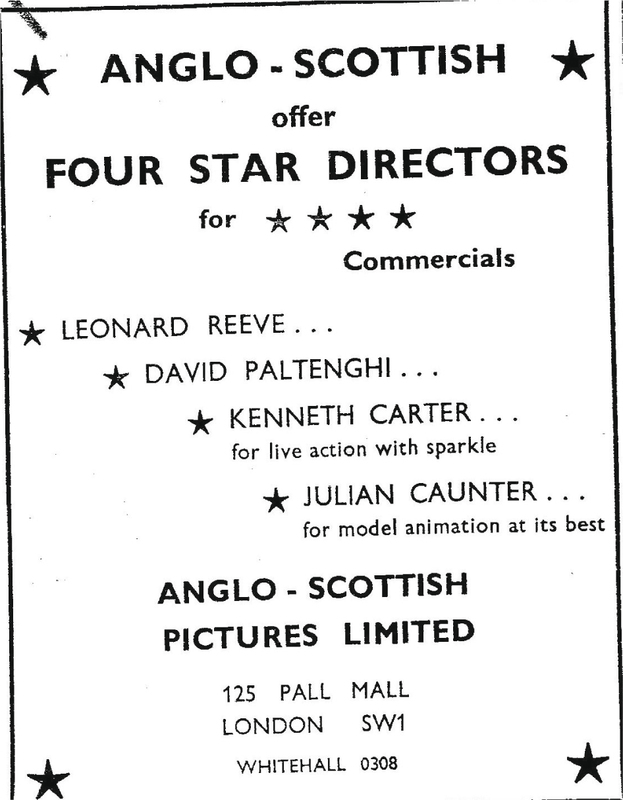 Anglo-Scottish Pictures, and their director, David Paltenghi, had already received ‘Honourable Mentions’ for their commercial for Martini at the 1958 International Advertising Festival53, and it was Anglo-Scottish pictures that produced Britain’s Grand Prix-winning television commercial at Cannes. Commissioned by the advertising agency, Clifford Bloxham, for their client, Schweppes Tomato Juice. This is a television commercial that exemplifies a British ad for British tastes. 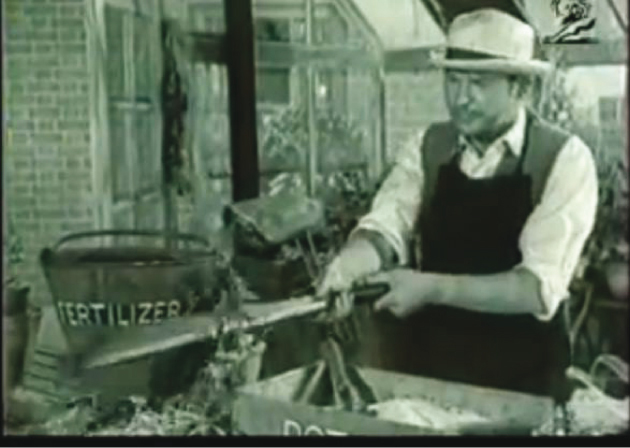 The commercial parodied the familiar format of the television gardening programme. It was one execution in a campaign that Clifford Bloxham Advertising had created for their client; each of the commercials parodied a different television or film genre. In spite of this success, Anglo-Scottish maintained their business in sponsored films for training and public relations until the company closed in the late 70s. 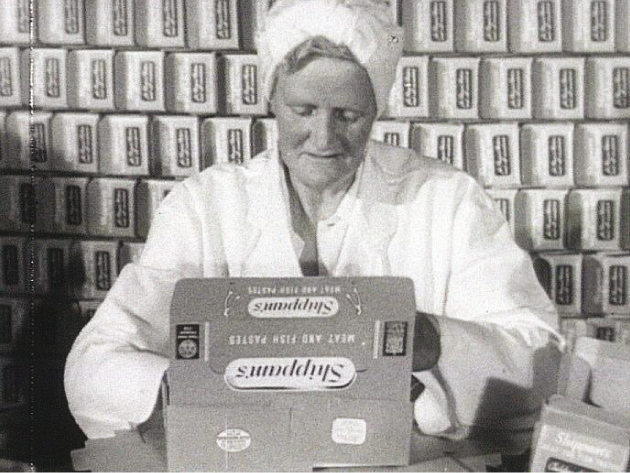 By the early 60s, although André Sarrut and Dollywood continued to produce commercials for the British market, the volume appears to have diminished. 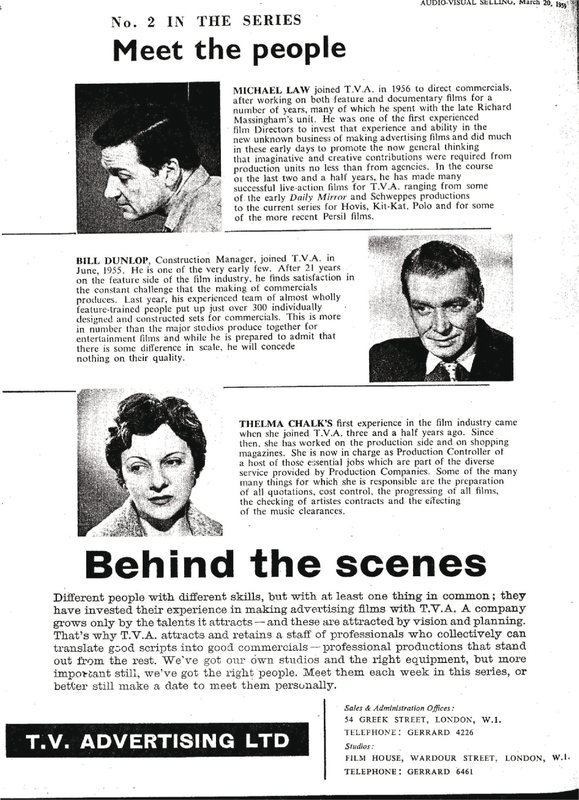 As this paper has suggested this is likely to have been due to a combination of factors: the opportunites available to them in the wider European market, the determination of London advertising agencies to keep creative control, and the likelihood that it was simply cheaper and more convenient to use production personnel and facilities from Britain, even if the shoot was to be on location. However, the the British film production industry had responded magnificently to the opportunity offered by commercial television advertising. By the early 60s, London advertising agencies appeared to have no qualms about commissioning local production houses to make commercials for their largest and most prestigious clients. The London production industry had benefitted significantly from the preparedness of feature film directors and cinematographers to make TV ads, and the established sponsored film production companies providing their skills to the advertising agencies. In addition, an entrepreneurial group of companies and individuals, including TVA, had convinced the advertising industry that British advertising could be produced in Britain with all technical expertise and creative flair of their Continental counterparts. Following a career as a brand planner and communication strategist, in advertising and marketing agencies, I am now a freelance consultant and writer and received my doctorate from Birkbeck College in 2016. My thesis assessed the impact of the launch of commercial television advertising, in its first ten years, on the creative and production industries, the viewers and broadcast regulation in Britain. My research interests lie in the impact of new media on the creative and production industries, and the history of television in the UK. 6 These would include Asa Briggs, The History of Broadcasting in the United Kingdom, Volume. 5: Competition, Oxford University Press, 1995.